Thoughtful Thursdays is created for moms who need her little space in the interwebs as keepsake of her dreams, worries and thoughts. Today, my little boy grabbed the comb and asked if he can comb my hair. I said yes. "You’re pretty”, he said. Then he sat on my lap and told me, "I love you. You're the best mom ever." Though I know, he must have just heard this from a TV show or something, still, I abruptly burst into tears. Admittedly, this whole "mommy thing" was never my strongest suit. Books were much easier for me to handle than babies. Books begin and end from cover to cover. But a baby endlessly gets you covered up in all sorts of ickies and goos, from beginning (of the day) ‘til the end. I have recited thousands of times in front of a class, made a debate speech, with so much confidence, but my nerves wrack whenever I need to give a lecture to my son about how he should behave. Like most parents, my days are filled with constant struggles, lots of yelling, breakdowns, tantrums, and plain old crying – mostly on my part (what can I say, parenting is one overwhelming task). There are days when I literally cannot get up from bed because I feel too scared and anxious that I might make a mistake and scar my child for life. At the back of my mind, I doubt myself. Were my methods correct? Am I even fit to be someone's primary source of morals and principles? Am I even capable of raising him into a decent human? All these questions plague my mind, day in and day out. Even while I am composing a thought in my head on how to reason out and explain to my son what a certain concept is, I am filled with doubts. I keep editing it over and over, much like how I type this essay. But all my doubts and questions suddenly disappeared today. It was never a matter of perfection. It was showing him that I am human just like him, who makes mistakes every now and then, yet still can rise up to any challenge. It was doing all that I can, with all that I have, mustering enough courage and love, to get up and “mom-up” for another day. I have heard the verdict from no less than the most important critic of all: The one who sees my struggles and imperfections. An innocent affirmation, just what I needed these days. I hope you get yours, too. 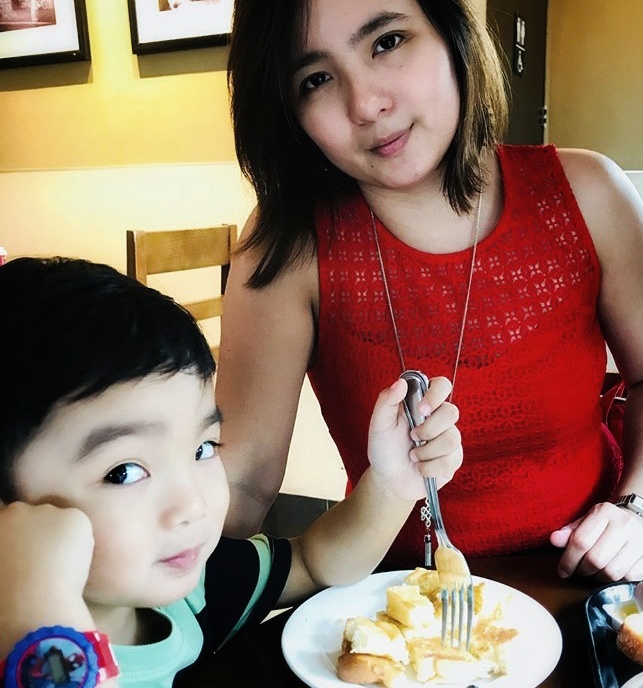 Ann Mitra is a stay-at-home mama living in Manila with her husband and 4-year-old son. When mommy and wifey duties are done, she curls up somewhere in the house to read a good book or to write and pour her heart out.